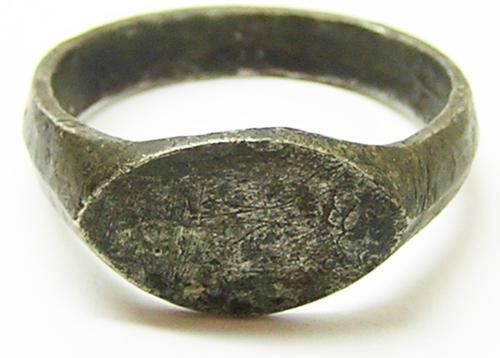 This is a nice medieval silver finger ring, dating to the 13th - 15th century. The ring is of a simple form, with an unengraved vessica shaped bezel. The hoop of the ring is angled, similar to inscribed rings of the 13th century. Vessica or almond-shaped seals are often associated with the ecclesiastic community, so perhaps this ring was intended for a signet or iconographic use. A good ring in excellent excavated condition, wearable with care. PROVENANCE: Ex. Private Collection, York.